Baby shower themes don't have to be gender-specific. Even if the mom-to-be knows the gender of her baby, she might not want you to reveal whether she’s expecting a little boy or girl at the shower. 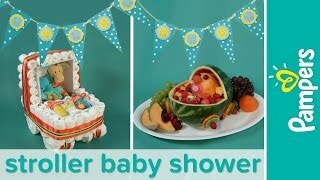 Watch as Allison shows you how to plan a stroller-themed baby shower party. Stroller Diaper Cake: A stroller-shaped diaper cake not only makes a show-stopping centerpiece, but it also makes a thoughtful gift for the mom-to-be — diapers are always needed and appreciated. So why not get creative, and give the practical gift of diapers in a fun way? A stroller diaper cake is easier to make than you might think. Just gather some diapers and a few basic craft supplies, and follow our step-by-step guide. The tutorial comes with images and videos, so you’ll be able to create the best stroller diaper cake in no time at all. Stroller Banner: You can also make a simple, yet charming banner featuring stroller-themed cut-outs to liven up the party venue. Download our template, then grab some supplies from your nearest craft store, and get started on some cool baby carriage decorations. Cut out the scalloped circles and the stroller decals using the template. Make sure to use different colored card stock. Decorate the triangles, if you like. For example, use the eraser end of the pencil, dipped in paint, to make little polka dots. Glue the decals to the scalloped circles to make the stroller medallions. Stick one medallion to each banner flag triangle using the adhesive foam squares for a 3D effect. Hole punch the top right and left corner of each flag, and run your string or ribbon through the holes to link the flags. Then, you can string up your banner. Fruit Salad: Crowd-pleasing snacks are easy with the versatile stroller theme. Why not serve fruit salad out of a watermelon carved in the shape of a stroller? Trust us; you've got this! Use a melon baller to scoop out the watermelon, and save it for later. Finish cleaning out the watermelon with a large spoon. Prepare the stroller wheels by slicing an orange and a lime into four circles each. Layer one lime circle on top of each orange circle, and secure them on the side of the watermelon using a toothpick. Top each toothpick with a raspberry. Slice the rind off a cantaloupe, and cut it in half to use as the baby's head. Then, use half a grape for each eye and a ball of watermelon for the nose. Secure each into place with a toothpick. Cut a small triangle where the mouth of the baby would be, and fill this space with a pacifier. Now, just fill the empty watermelon with fruit, and display the baby head on top. All finished! Any questions? Watch this video for more detailed instructions and a full list of supplies. With a gender-neutral stroller theme, if the mom-to-be wants to, your shower could be the perfect opportunity for her to reveal the baby’s gender. Invite guests to make their boy or girl predictions on a chalk board or white board, and then award prizes to those who guessed correctly. If you’d like inspiration for more shower games, check out these helpful game ideas. While you’re at it, why not involve the shower guests in the baby-naming process? Invite guests to see how many names they can come up with using only the letters in the mom- and dad-to-be's names. If the parents-to-be don’t discover a name they love through this game, you can always suggest they visit the Baby Name Generator to find the perfect baby name. If you’d like even more gender-neutral baby shower theme ideas, consult our baby shower theme tool. We've got everything you need, from decoration and food ideas, to party games and activities.